Rather strangely, the write-up of my recent Douro trip begins at a dinner in London. It feels slightly odd starting here, but this event was the catalyst for my trip a couple of weeks later. I’ve been following the striking table wines from Dirk Niepoort with some interest over the last couple of years, and so I was glad that Danny Cameron (of Raymond Reynolds, the UK importers) invited me to a winemaker’s dinner with Dirk in the week of the London trade fair. I was even more pleased when I found out that Danny had seated me next to Dirk, which gave me an ideal chance to get to understand what he is trying to do with his wines. Straight away, I asked what his winemaking philosophy was. ‘I like wines with extremes’, he explained. ‘As rich and tannic as possible, but they have to have harmony’. So what does he like to drink at home? This is always a revealing question. For whites, he prefers Mosel Riesling (Haag, Loosen and Willi Schaefer are mentioned) and white Burgundy. He likes Champagne, too. And reds? ‘Red Burgundy, when it is very good, is the best wine in the world’. We began tasting with Dirk’s whites. White wines are rare in the Douro. The problem is that it’s simply just too hot to grow white grapes successfully in most parts of the region. However, since 1995 Dirk has fashioned a very successful white Redoma by using grapes grown in vineyards over 400 m in altitude, which helps preserve acidity. 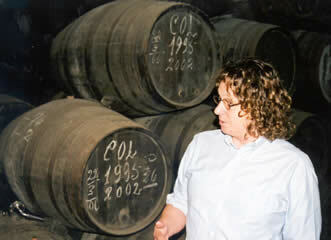 The Reserva is a selection of the finest barrels, aged for longer in mostly new oak. 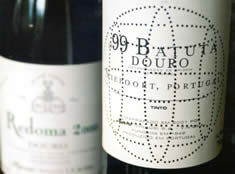 With Batuta, Dirk’s aim is to make a ‘monster' wine, but at the same time one that it extremely elegant. Rather enigmatically he says, ‘I like wines that are a bit in excess, but always tasting the opposite of what they are’. In contrast, with Charme his aim is ‘finesse, finesse, finesse’. Charme is an unusual wine in several respects. First, it’s made in a slightly surprising way. The grapes are foot trodden in lagares (large, shallow stone troughs) with the stems, which you’d think would result in a harsh, tannic wine. But Dirk’s view is that foot-treading with stems can actually produce elegant wines, and he cites Domaine de la Romanée Conti as his precedent. ‘It’s very difficult to make wine with stems’, he says. ‘If they are too green, they result in aggressive, unbalanced wines with off flavours’. Timing the pressing correctly is also important. ‘In 2001 we missed pressing of one lagar by five hours. It won’t be a Charme.’ Interestingly, Dirk alludes to the fact that his inspiration for Charme comes from Grand Cru red Burgundy. 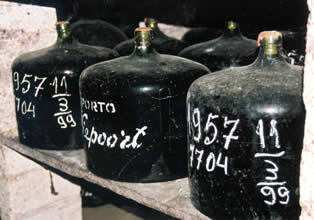 Burgundy-like wines from the Douro? Watch this space. The other unusual thing about this inaugural Charme is that it received Pingus-like 200% new oak treatment (malolactic fermentation in new barrels followed by racking to more new barrels). Dirk say that this is not an experiment he will repeat, although the result is not as oaky as you’d think it might be. Youthful at the moment. Hugely concentrated, rich, spicy and very tannic, with a roasted edge. A massive wine with real class. Sensational potential, but very difficult to assess properly in this youthful state. It was getting late and a number of people had already left. But more was to come. To the remnant, Dirk poured his three top 2000 ports blind, and invited comments.